The library is a governmental institution that participates in civil service through the city of Albany and the New York State Retirement System. We are a union shop with the majority of our employees represented by Albany County Local #801 of CSEA, Local 1000 AFSCME, AFL-CIO. Candidates for library employment are selected from civil service lists maintained by the city of Albany. Two positions – library clerk and account clerk – have continuous recruitment. Civil service tests for other positions, including library assistant and librarian (I, II, III), are offered at set times. Tests for most administrative positions are held sporadically, so these employees are sometimes hired on a provisional basis. Examinations for the Librarian II position are now available as continuous recruitment! Anyone interested in applying for this exam should go to the City of Albany’s employment website. We love our volunteers and appreciate their willingness to give of their free time to help with our programs & services. College groups, retired professionals, seniors, & others with a charitable spirit who are looking to give something back to their community can volunteer at the library. If you are interested in volunteering, please fill out the volunteer application and drop it off at one the library branches or email it to the volunteer coordinator at volunteer@albanypubliclibrary.org. Volunteers will work with a group of seniors to teach basic technology skills, mainly skills focused on Android & Apple phones. The group meets on select Mondays from noon – 1pm. science. Talks are held on the second Friday of each month from 2 – 3pm. Speakers are needed for April, May, & June. Teach Adobe Photoshop and/or Premiere, Tinkercad and/or Blender (3D design programs), or crocheting in our makerspace! Volunteers will teach a workshop in their area of expertise. Workshops are held 1 – 2 times per month for 1 – 2 hours at a time. 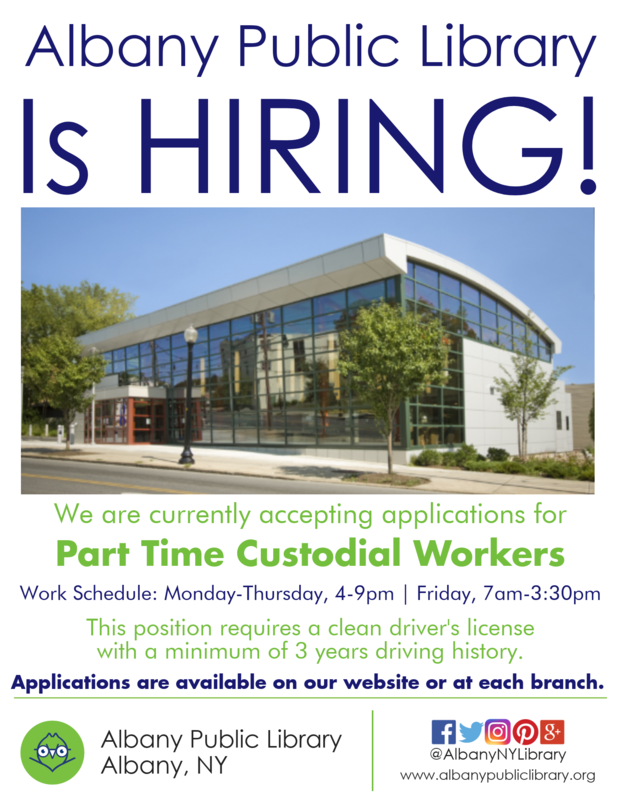 Seeking volunteers who can work Monday, Tuesday, or Wednesday evenings. Volunteers will teach either guitar or piano to children & adults. Schedule will be decided between Howe library staff & the volunteer. If you are interested in any of these opportunities, please fill out the volunteer application and drop it off to us or email it to the volunteer coordinator at volunteer@albanypubliclibrary.org.